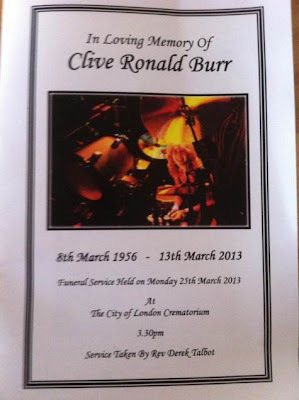 A funeral service for former Iron Maiden drummer Clive Burr was held on Monday, March 25 at the City Of London Crematorium in London, England. Burr died on March 12 in his sleep at his home at the age of 56 after suffering from multiple sclerosis for many years. 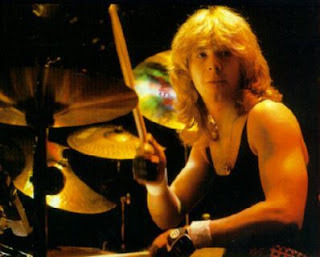 Burr joined Maiden in 1979 and performed on the band's first three albums: “Iron Maiden” (1980), “Killers” (1981) and “The Number Of The Beast” (1982). Prior to that, he was a member of Samson. At the time of his passing, Maiden founder and bassist Steve Harris commented, “This is terribly sad news. Clive was a very old friend of all of us. He was a wonderful person and an amazing drummer who made a valuable contribution to Maiden in the early days when we were starting out. This is a sad day for everyone in the band and those around him and our thoughts and condolences are with his partner Mimi and family at this time."